Astronomers from Swinburne University of Technology in Australia, and the University of Minnesota Duluth in the USA have provided a way for armchair astronomers, and even primary school children, to merely look at a spiral galaxy and estimate the mass of its hidden, central black hole. The research was supported by the Australian Research Council and has been published in the journal Monthly Notices of the Royal Astronomical Society​. 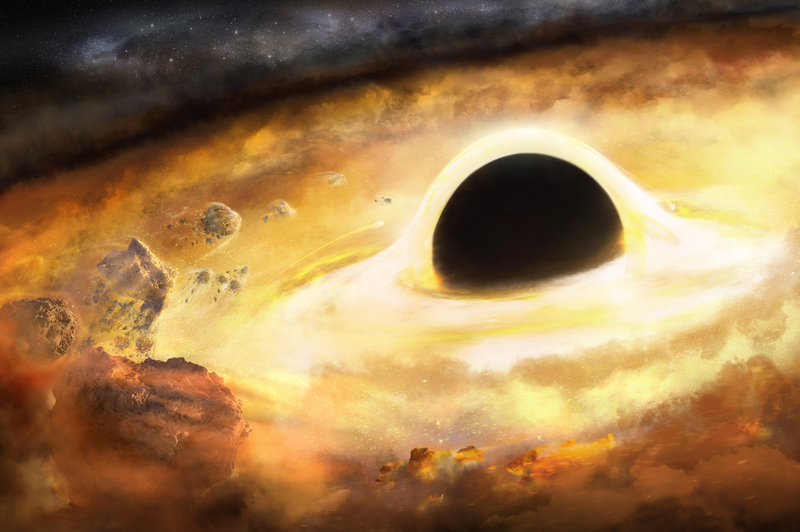 Given that black holes emit no discernible light, they have traditionally been studied via highly technical observations of the stars and gas orbiting around them, which in turn provide a measurement of how massive they must be. Now, research based on these pre-existing measurements has shown that a black hole’s mass can be accurately estimated by simply looking at the spiral arms of its host galaxy. Nearly a century ago, Sir James Jeans and Edwin Hubble noted how spiral galaxies with large central bulges possess tightly wound spiral arms, while spiral galaxies with small bulges display wide open spiral arms. Since then, hundreds of thousands, if not millions, of spiral galaxies have been classified as type Sa, Sb, Sc, Sd, depending on their spiral arms. Prof Marc Seigar, associate dean of the Swenson College of Science and Engineering at the University of Minnesota Duluth, and co-author of the study, discovered a relationship between central black hole mass and the tightness of a galaxy’s spiral arms nearly a decade ago. Dr Benjamin Davis and Prof Alister Graham, from Swinburne’s Centre for Astrophysics and Supercomputing, led the new research revising this connection between black hole mass and spiral arm geometry. After carefully analysing a larger sample of galaxies, imaged by an array of space telescopes, the researchers observed an unexpectedly strong relationship, and one which predicts lower mass black holes in galaxies with open spiral arms (types Sc and Sd). Given that it is the discs of galaxies that host the spiral pattern, the study highlights the poorly-known connection between galaxy discs and black holes. Moreover, the procedure allows for the prediction of black hole masses in pure disc galaxies with no stellar bulge. “This implies that black holes and the discs of their host galaxies must co-evolve,” said Dr Davis. Working within the Australian Research Council’s OzGrav Centre for Excellence, the astronomers intend to hunt down these elusive black holes, and investigate implications for the production of gravitational waves: those ripples in the fabric of Einstein’s space-time that were first announced by the LIGO and Virgo collaborations in 2016.